Video Highlights Danger Of Texting While Driving Despite the dangers of texting while driving, people still do it all over the world. A graphic new video public service announcement made in Wales and showcased on YouTube shows just how lethal it can be. The video will be shown in schools throughout the U.K. this fall. Despite the dangers, many people text while driving. The dangers of texting while driving should be blatantly obvious. Yet lots of people still do it all over the world. A graphic new video public service announcement shows just how lethal it can be. It was made in Wales, but thanks to YouTube it has gone viral around the world. In the video, three young girlfriends are driving down a two-lane highway. They're laughing. The radio's playing. The driver is texting. For an instant, the driver takes her eyes off the road to look for the address she wants to send the message to. The car swerves into the oncoming lane and crashes head-on with another vehicle. Three cars are involved in this terrifying depiction. Viewers don't find out how many are killed in the crash, but its gruesome nature leaves enough for the imagination. The video PSA was a collaboration among filmmaker Peter Watkins-Hughes, a police force and a high school in Gwent, Wales. It'll be shown in schools throughout the U.K. this fall. Watkins-Hughes posted the video on YouTube so that a friend, who is a BBC producer in London, could see it. Within weeks its popularity soared. "I think the film strikes a chord because it is a new global problem," says Watkins-Hughes. "We've got people using mobile phones [while driving] who are dying needlessly." Recent studies show texting while driving is on the rise and that it increases the risk of crashing more than talking on a cell phone while driving. In the U.S., texting while driving is illegal in 14 states. There have been some visceral reactions to the video PSA online. One reader wrote, "It scared the crap out of me." Another said: "It should be aired on every TV station in the world multiple times." 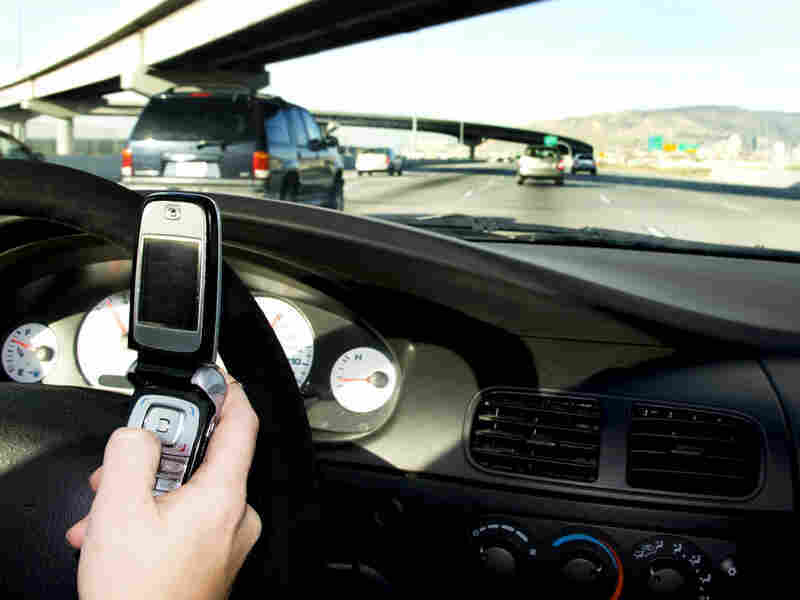 Marc Hughes, a 25-year-old from Collegeville, Pa., admits that he texts while he drives. He says he was shocked by the video. "It was pretty graphic," he says. "It definitely causes you to pause. It's something that really could happen." So, will he stop texting while driving? "Honestly," says Hughes, "I can't say that's going to stop me from texting." Rob Foss isn't surprised by Hughes' response. Foss is director of the Center for the Study of Young Drivers at the University of North Carolina. He says he watched the first two minutes of the video PSA from Wales, but then stopped. "I've seen this sort of stuff so many times, I didn't watch the rest of it," he says. He believes scare tactics don't change something as complex as human behavior, even when people declare that it will. "When you talk to the public and especially teenagers they say, 'Oh yes, that would make me behave differently.' Well, people don't know what would make them behave differently," he says. Philip Povero, the sheriff of Ontario County in New York, is more hopeful. In 2007, five young women were killed in a head-on collision in Ontario County. The driver's cell phone was sending and receiving text messages within a minute of the crash. Povero believes PSAs like the one made in Wales should be part of a larger effort to get people to stop texting while driving. "Each little piece, each PSA, each presentation by law enforcement personnel, they're all spokes in this wheel of prevention," Povero says. "Hopefully we'll get the message out and we'll see substantial reduction in this behavior by drivers." Even skeptic Foss believes some good may come of the texting-while-driving PSA: It might get the attention of lawmakers.